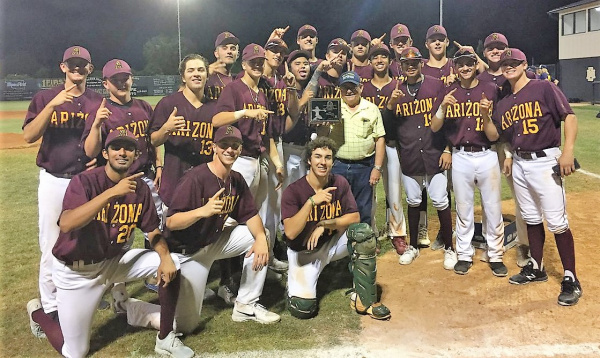 Team Arizona went undefeated to win the Junior Sunbelt championship. Mesquite standout T.J. Clarkson was named MVP and Red Mountain junior Kai Murphy earned Outstanding Pitcher status. Clarkson has committed to play for San Diego and Murphy is headed to Oregon State. 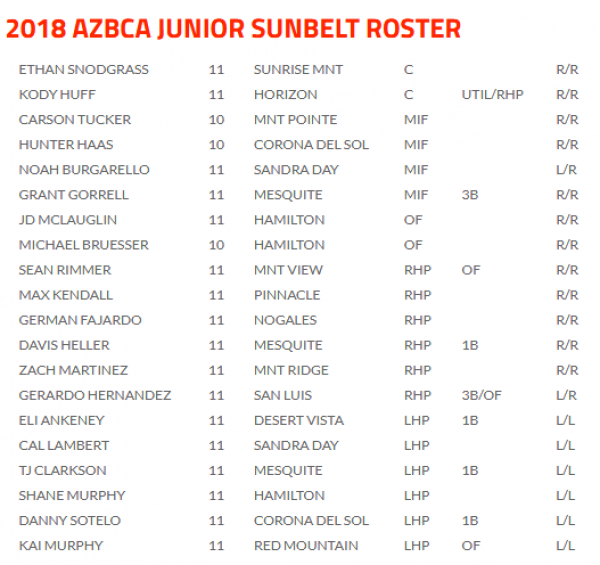 Eli Ankeney (Desert Vista), Carson Tucker Mountain Pointe), Michael Brueser Hamilton) and Sean Rimmer (Mesa Mountain View) were also named to the All-Tournament Team. Clarkson batted .440 with four doubles, two home runs and 10 RBI; Rimmer hit .458 with three doubles, a triple and a home run along with 10 RBI; Tucker hit .387 with two triples, a home run and 12 RBI; Brueser went .433 with four doubles, a home run and 10 RBI; Ankeney won one game and collected five strikeouts and gave up one hit and Murphy picked up six strikeouts in his victory. 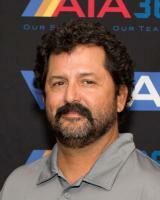 Tolleson head coach Scott Richardson managed Team Arizona.